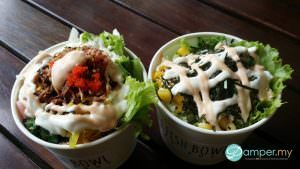 Hawaiian-styled Poke Bowl has taken the health food scene by storm and this growing trend has recently hit the shores of Malaysia. 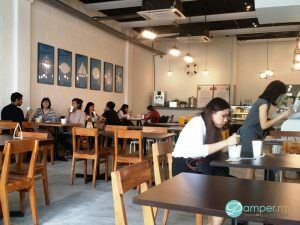 The Fish Bowl is among those restaurants which is ushering in this new trend in the Klang Valley. After listening to praises by many people, we’ve decided to pay a visit to The Fish Bowl and try it ourselves. Poke (pronounced as PO-kay) is a chopped and chilled salad of diced raw seafood, served on top of a bed of rice, with toppings such as sesame seeds, edamame, mango, almonds and many more. 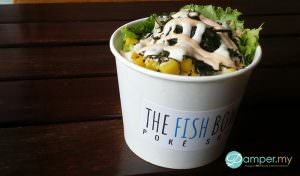 The Fish Bowl’s ordering process is similar to most fast-casual restaurants with a little twist – select your order of preferred carbs, protein, vegetables and sauce on a piece of paper to build your own poke bowl. 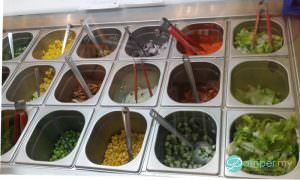 First, select your base – we chose brown rice, but you might prefer white rice or leafy greens. Next, pick your sides which include cucumber, carrots, onions, shallots, red radish, edamame, corn, cherry tomatoes, mango, pineapple, almonds or walnuts. Naturally, the stunner of a Poke Bowl is none other the raw seafood. 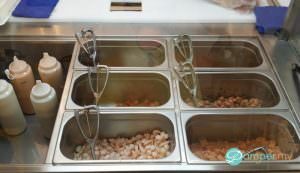 The Fish Bowl offers proteins ranging from marinated salmon (shoyu, kaffir lime or sriracha), tuna (shoyu, kaffir lime or shoyu chilli), shrimp (garlic) & honey herb chicken. Last but not least, pick toppings of green onions, pickled ginger, wasabi, ebiko, chilli flakes, furikake, seaweed flakes, sesame seeds, fried garlic chips and fried shallots. Voila, you now have an incredibly healthy and refreshing meal. 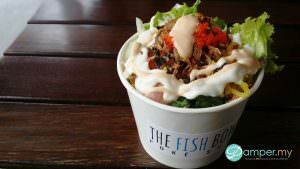 A standard Poke Bowl paired with bottomless beverage cost RM17.90 nett. 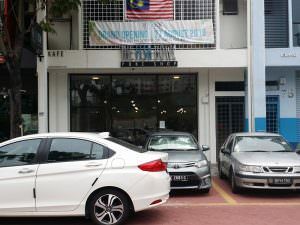 Due to the nature of its location, The Fish Bowl mostly attract students from Sunway University and Monash University. Also, many youngsters love to dine here due to the naturally bright atmosphere, which makes up for awesome Instagram-worthy pictures. 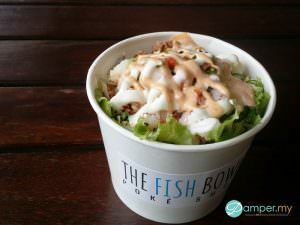 Aaron Lim, owner of The Fish Bowl told us that we can expect a delivery service in the near future. 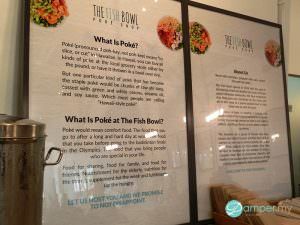 The poke bowl is not just a tasty meal; it’s also healthy and nutritious. Fresh seafood such as Salmon and Tuna contains omega oils, plus there’s a good mix of vitamins and fibre. Couple this with fresh vegetables, nutritious fruits and tasty toppings, Poke Bowl is a perfect bridge to a long and healthy life.